About 50 people gathered at Lockheed Martin in Sunnyvale, California to reflect and pray about the consequences of war and empire to the earth and all life on the earth. Under the umbrella of the Pacific Life Community, Catholic Workers, people in religious orders, students from Notre Dame de Namur University in Belmont, and many, many friends gathered to remember those who suffer today. Lockheed Martin is the world’s largest military contractor and a full-service weapons maker. Lockheed makes, among other things, missiles that carry Trident nuclear warheads, and hellfire missiles that are used by drones. 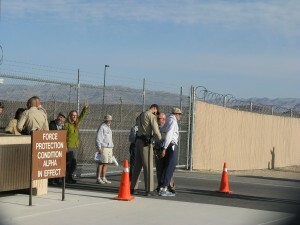 After the Stations of the Cross, three people walked up to the Lockheed Martin gates. When stopped by police, they knelt down in prayer. 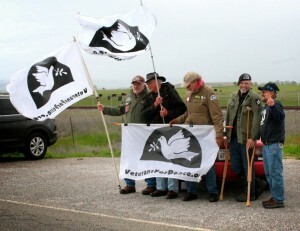 On Wednesday, April 16, 2014, at about 8:10 a.m., nine anti-war activists were arrested at Creech Air Force Base (AFB) when attempting to serve a War Crimes Indictment (see below) to Creech AFB Commander Col. Jim Cluff. 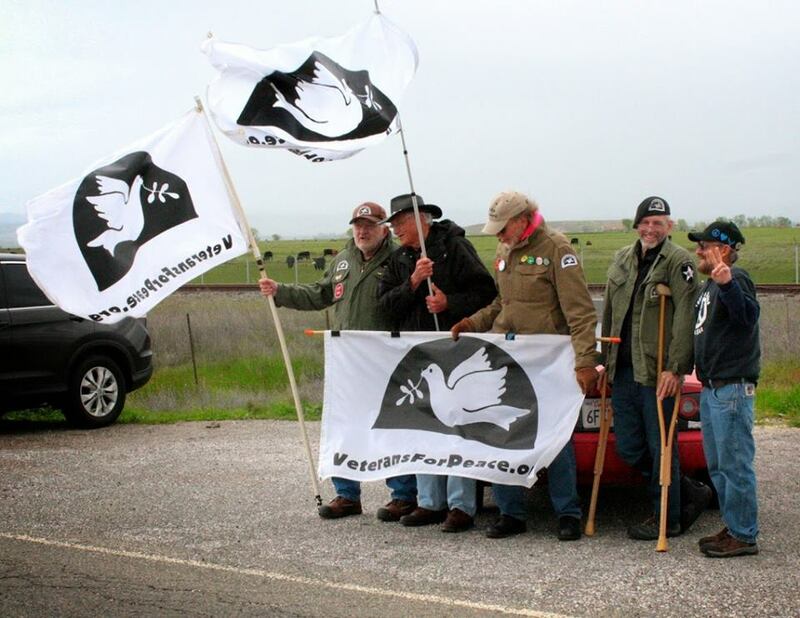 The nine are part of the Nevada Desert Experience’s 2014 Sacred Peace Walk, which will end at the Nevada National Security Site/Nevada Test Site on April 18, 2014. The illegality of the CIA “secretive cluster of units within the wing call the 732nd Operations Group” can no longer be denied or covered up. Hundreds of children have been murdered along with thousands of innocent men and women. The CIA is using Creech Air Force pilots to carry out drone strikes in Pakistan. The War Indictment could not be delivered at a more timely moment. Tamara Severns was arrested unexpectedly during an April 6 protest of drone warfare at Whiteman Air Force Base, near Knob Noster, Missouri. A member of the PeaceWorks, Kansas City Board of Directors and a Co-member of the Loretto Community, Tamara was walking toward the Visitors’ Center to use the bathroom. 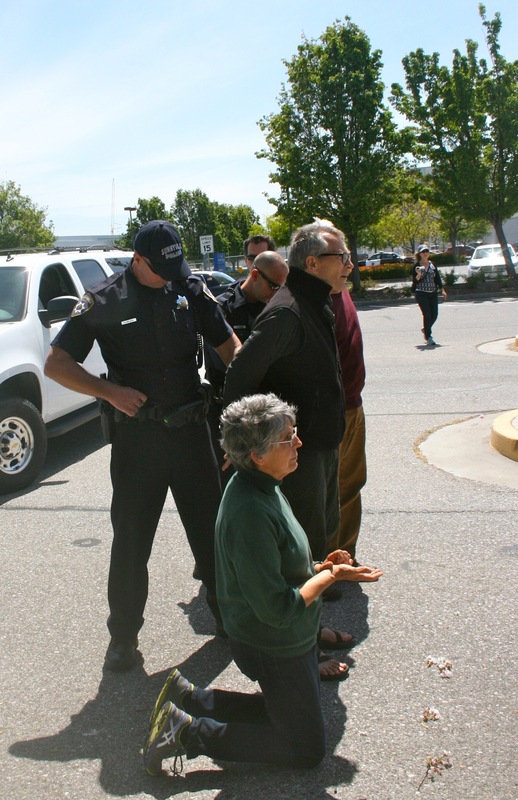 She and other resisters had used those facilities with no problem during about five earlier protests. On April 6, Tamara and several others had arrived at the base entry after authorities had warned the resisters not to step across the white line on the entry road. 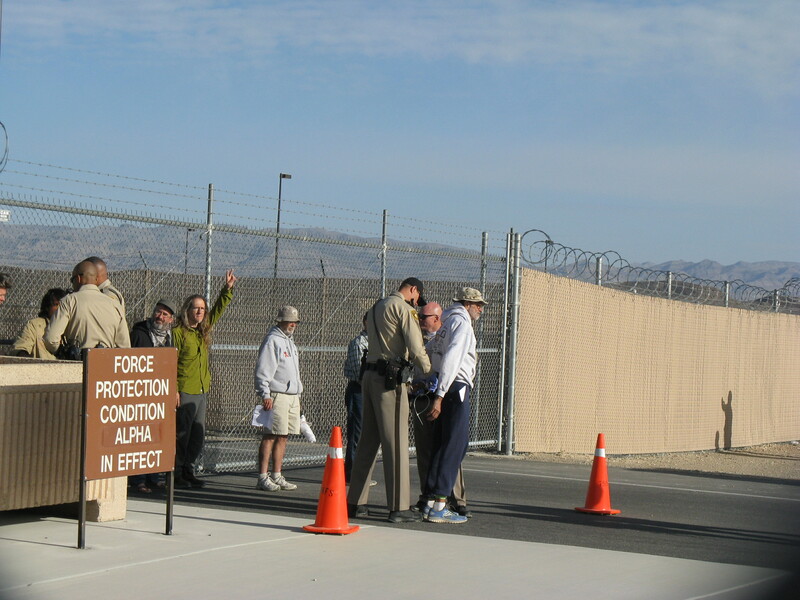 Unaware that “the rules” had changed, Tamara crossed the line to go toward the Visitors’ Center, was taken into custody with no warning, and was handcuffed, searched, and detained on the base about an hour. Today, April 7, 4 people total were arrested in Gangjeong. The police where very aggressive today and blocked us excessively. They even blocked the daily human chain and dancing time even when there were no cars. This made everyone very angry and frustrated and everyone began demanding an apology from the police. Of course the police didn’t apologize because the police never do that. 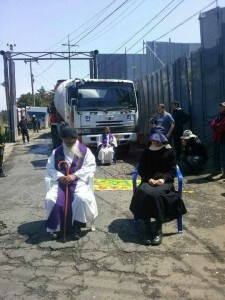 In response, Father Kim Sung-Hwan began blocking a cement truck. The police came and threatened to arrest him but didn’t for a long time. Father Mun and two Sisters and once activist also came and sat with him. Finally the police arrested Father Kim but not the others. The others continued to block the trucks. The police threatened to arrest them many times but didn’t, but then finally they arrested Father Mun, the activist Lee Jong-Hwa, and Sister Rosalina. Also arrested was Adam’s friend and fellow Veteran for Peace member Richard Gilchrist. Gilchrist served in the army in Vietnam and has also traveled around the country speaking and taking action for peace.